A new book edited by four Duke University scholars examines how crisis events can reshape law and regulation, and how we can learn to do better. 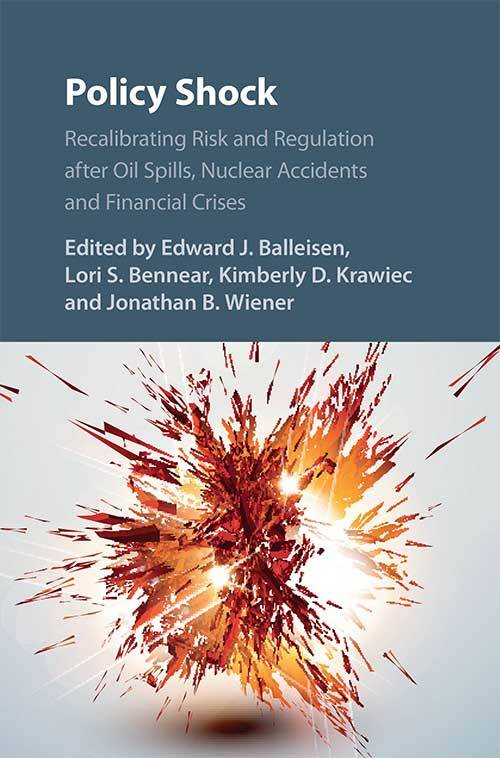 Policy Shock: Recalibrating Risk and Regulation After Oil Spills, Nuclear Accidents, and Financial Crises looks at policy responses to those events over the last century in the United States, Europe, and Japan, assessing how each event influenced changes in regulation, law, and institutions. In addition to 10 case studies of crisis response that demonstrate how reactions and policy reforms vary, a series of conceptual essays written by scholars from economics, psychology, and political science offer perspectives on risk analysis and perception, and how social and political actors try to frame crises to galvanize reform. The book’s final section considers how governments can learn from crises and how legal and regulatory responses can ultimately be improved. “This book is part of our larger project on how laws can learn,” said book co-editor Jonathan Wiener, the Perkins Professor of Law, Professor of Environmental Policy, and Professor of Public Policy. “In general, governments and legal systems don’t conduct evaluation and learning very often or very systematically. We studied cases in which there has been regulatory change after a crisis, to examine how learning can work better in the future.” The book reflects the culmination of a multi-year, cross-disciplinary inquiry, and is co-edited by Edward Balleisen, Professor of History and Duke’s Vice Provost for Interdisciplinary Studies; Lori Bennear, the Juli Plant Grainger Associate Professor of Energy Economics and Policy at the Nicholas School of the Environment; Kimberly Krawiec, the Kathrine Robinson Everett Professor of Law; and Wiener. The project was convened by the Rethinking Regulation program at Duke’s Kenan Institute for Ethics, which Wiener and Bennear co-direct. All of the co-editors contributed essays to the book. Wiener spoke to Duke Law Magazine about Policy Shock, which will be published in October by Cambridge University Press. Duke Law Magazine: What was your starting point for this project? Jonathan Wiener: It’s become commonplace to say that crises drive regulation, that a lot of regulation is crisis-driven, whether it’s in the three cases highlighted in our book — oil spills, nuclear accidents, and financial crises — or others. There are many examples: The 1972 Clean Water Act was passed after Ohio’s Cuyahoga River caught fire. The 1980 Superfund law was adopted after the discovery of hazardous waste in Love Canal, New York. The Oil Pollution Act of 1990 was enacted after the Exxon Valdez Oil spill in Alaska. Those are just a few. Of course, not every law is driven by a crisis. Still, people often point to crisis events as leading to major regulatory action. And yet there was a need for research on how that actually occurs, and on the variety of different types of regulatory change that have followed crisis events. This book tries to get inside the crisis-response relationship. When a crisis yields regulatory change, what is really happening? How does it happen? And how did it happen in different ways in different social, legal, political, and historical settings? DLM: The book includes a series of conceptual essays on recalibrating or reframing events, essentially asking how people and policymakers interpret them. JW: The very idea that an event is called a crisis is not self-evident or pre-ordained. That label is the result of the way people perceive it psychologically and culturally — and also how it is framed by actors, by protagonists, who are trying to achieve their goals by characterizing the event to shape a narrative for future policy. So we have a chapter in the book on perception and psychology, by Elke Weber of Princeton. We have a chapter on framing the narrative by Frederick Mayer of Duke’s Sanford School of Public Policy. We have a chapter on how focusing events galvanize political attention by political scientists Thomas Birkland and Meg Warnement. We have a chapter on risk and insurance by Carolyn Kousky. One interesting question that Lori Bennear addresses in her conceptual chapter is whether a surprise event that is being labeled a crisis should be interpreted as a “bad draw” from the distribution of possible events that we already had forecast — a less likely scenario but still in the distribution of anticipated risks, so our understanding of how the world works does not need to be changed — or, alternatively, does this surprise event indicate that the distribution has shifted and we need to revise our understanding of the world and shift our forecast of future risks? That’s a difficult puzzle that analysts have to face when something like this occurs. DLM: What did the case studies in the book reveal about events such as the global financial crisis of 2008, the 2010 blow-out of at British Petroleum’s Deepwater Horizon drilling platform, and the 2011 meltdown of the reactor at Japan’s Fukushima Daichi nuclear power plant? JW: We offer case studies of different crises in different countries at different times. Broadly, we found that it’s not just that crises lead to regulation, period, but that crises lead to a wide variety of different regulatory changes. There’s variety across the types of crises, variety across countries, variety over time, and thus variety in the regulatory responses. Different attributes of each crisis may yield different types of regulatory responses. For example, a crisis that is framed as industry inadequately regulated — and behaving badly — may yield a regulatory response of tightening standards and increasing enforcement. An example of that might be the Oil Pollution Act of 1990 tightening standards and increasing enforcement. Or a crisis that is framed as the government being too fragmented — it did not connect the dots and put together complex risk information and, therefore, missed the signal — may result not so much in tightening standards as in integrating government organizations. That was a major criticism in the wake of the Sept. 11 terrorist attacks, and legislation then merged several agencies into the Department of Homeland Security. At some other times, a crisis is framed as the government being overly integrated, such that there is a conflict of interest within the government agency between part that was supposed to regulate safety and part that was supposed to promote resource use. Some parts of the Department of the Interior were split up after the BP Deepwater Horizon oil spill of 2010 because they were thought to be too cozy with each other. We also look at similar crises across countries, which indicates that different social, political, and legal settings also affect the regulatory responses. For example, after several nuclear power plant accidents, there were different regulatory responses in the United States, Europe, and Japan, and even within Europe. To take the most recent example: After the accident at Fukushima, the Japanese response, broadly speaking, was not just to shut down the four reactors at Fukushima Daiichi, but all 54 reactors across the country, that were producing a large fraction of Japan’s electricity. Germany responded by accelerating its phase-out of nuclear power, whereas France ordered a new round of inspections but maintained its reactors. In the United States, there were no immediate shut-downs of operating reactors after Fukushima. But one could say that the United States had had a de facto moratorium on new nuclear power plants since the Three Mile Island accident back in 1979, to which Japan had not responded (instead responding to other smaller accidents in Japan). After the Chernobyl accident in 1986, the U.S., Western Europe, and Japan did not adopt further restrictions on nuclear power, mainly because they said the Chernobyl reactor’s design and lack of containment structures were so different from those in the European, American, and Japanese reactors. So each nuclear accident was followed by differing responses across countries. DLM: The Rethinking Regulation program focuses, in part, on how legal and regulatory systems learn and how they can improve. How does Policy Shock fit into that broader research framework? JW: The broad idea of regulatory learning includes several mechanisms, such as responses to crisis events, retrospective review of past regulations to see how they have performed, and ongoing adaptive regulation. The crisis events discussed in Policy Shock are cases in which the regulatory system was not designed to learn from the outset but then was surprised and people scrambled to try to respond to the crisis. The ambition of adaptive regulation is not to wait until after a crisis, but to design regulatory systems that are built to learn from the outset, especially where we face uncertainty about emerging technologies and potential risks and benefits. We are leading a Bass Connections project on that concept this year. At the end of Policy Shock we suggest that governments should do two things. One is to learn to prepare for the crisis, to take into account the understanding of risk including that low-probability events might still occur, and to prepare for those. To some extent governments do this already, but there are still surprises, so we could do better to learn to prepare. The second message is that governments should prepare to learn. The crisis itself, although tragic, also offers lessons for the future. Governments often miss these lessons. They need institutional mechanisms to help learn from the surprising crisis if it happens. The penultimate chapter of the book stems from a Duke Bass Connections research team in which Ed Balleisen and Lori Bennear led a team of students in studying disaster investigation bodies, such as the National Transportation Safety Board — the NTSB — and the Chemical Safety Board in the U.S., and examples from other countries, like the Dutch Safety Board. The chapter suggests that it’s very helpful to have a crisis-investigation body that is “standing,” Rather than “one-off” ad hoc commissions of inquiry (like the 9/11 Commission or the Deepwater Horizon Commission), because, while one-off commissions are better than nothing, a standing investigatory body develops expertise and institutional memory from having examined event after event. It can learn to get better and better at understanding and diagnosing the crisis. We also ask whether these investigatory bodies, whether standing or ad hoc, should be part of or independent from the regulatory agency. Compared to the regulatory agency, an independent body like the NTSB may lack the power to implement its own recommendations, but it has the advantage of being able to be more candid than the agency would be about the possible shortcomings of past policies. Also, it’s not necessarily always the case that the safety board’s recommendations should all be adopted automatically. There should still be an analysis of their costs and benefits and of how best to implement them. The idea of a standing, independent investigative body or safety board is one key mechanism through which governments can prepare to learn. Surprises may happen — we can’t predict everything — but we will have equipped the regulatory system to be ready to learn from the crisis.